Newport IW FC will travel to Buckland Athletic FC in Newton Abbot on Saturday 12th November 2016 for their 2nd round fixture in this years Buildbase FA Vase. There are still places available on the coach for fans to travel with the team and we would like to see as many fans as possible join us and support The Port as they begin their conquest in this years Buildbase FA Vase competition. The club require all fans who are wishing to travel on the team coach on Saturday to confirm their space by no later than midnight on Monday 7th November 2016. All ferry bookings and coach travel has to be finalised and confirmed by Tuesday morning (8th). Full travel details for the day are outlined below. The cost of travel will be £25 per person. If you haven’t already confirmed your space with a member of the clubs staff please email urgently chairman@niowfc.com or telephone 01983 525027 (leave voicemail if required) to guarantee yourself a place on the day. Meet at Wightlink Yarmouth terminal at 8:30am. Catch the 8:45am ferry as foot passengers to Lymington. Board the club(s) travel coaches supplied by Destination Coaches at 9:30am. Expected arrival time at Buckland Athletic FC (Newton Abbott) approx 12:30 to 1pm. Buckland Athletic FC vs Newport IW FC will kick off at 3pm. Leave Buckland Athletic FC at approx 5:30pm with an expected arrival time in Lymington for 8:30 to 8:45pm. Return to the Isle of Wight via the Wightlink Lymington ferry at 9:05pm as foot passengers. Expected arrival time back on the Island will be 9:40pm. The cost of return travel which includes the ferry and coach will be £25 per person. 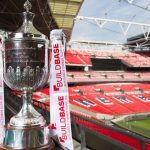 Confirmation of all spectators travelling to Buckland Athletic FC for the Buildbase FA Vase 2nd round need to be received by the club no later than midnight on Monday 7th November 2016. Sholing Development visited St George’s Park on Saturday 5th Nov and the 90 minutes was certainly full of fireworks. Both sides fielded young teams and no doubt Sholing looked a well organised set up, However they weren’t prepared for a Newport side that were determined to play as a team and win, and what a win it was. Early on Keelan Walsh got booked on the edge of Newport’s box. 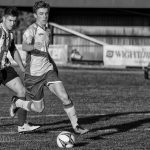 Callum Chase who ended as man of the match came into the centre back position with Caleb Charlesworth after Ollie West was taken by the first team late Friday night. Newport fielded Mark Taylor who partnered young Alex Harmer in central midfield. The game was end to end and Newport took the lead on 32 minutes after Jacob Reynolds put a free kick into a dangerous position and Jimmi Burton got the slightest of touches to put Newport one up. 5 minutes later Harry Wade hit the crossbar from close range where Newport should have gone 2 up. On 49 minutes the game exploded on the edge of the Sholing’s box when Keelan Walsh was fouled from a very late tackle. Sholing were awarded a free kick and sent Keelan Walsh off for a second caution. 30 seconds later Sholing’s keeper followed Keelan down the tunnel for descent at one of Newport players. The second half started as the first. Sholing piled the pressure on Newport but The Port stayed solid. On 65 minutes Newport should have doubled their lead when 3 separate players had shots at the Sholing goal as the ball ricocheted around Sholings box but Newport just could not get the ball into the net. With the final whistle looming the Sholing centre forward was put through and with just the Newport keeper to beat he shot and Jamie Linington pulled off the save of the match. The final whistle was welcomed by all and closed a game that Newport deservedly won. Jamie Linington, Jacob Reynolds, Keelan Walsh, Caleb Charlesworth, Callum Chase, Lewis Wade, Jimmi Burton, Mark Taylor, Alex Harmer, Joseph Thumbi, Harry Wade, Harrison Yates, Jack Turkington, Liam Sumpter, Harry Green.